Note: If this information doesn’t match what you’re seeing, you may be using Office 365 after the service upgrade. Try Connect an Excel Web Access Web Part to an Excel workbook and Create reports, scorecards, and dashboards by using Excel Services to find the information that applies to you. Important: Before you can display a workbook in an Excel Web Access Web Part, you must publish the workbook to Excel Services or upload the workbook to a document library on the site. This procedure describes the specific steps that you have to take to add an Excel Web Access Web Part to an existing Web Part page. To add a Web Part to a page, you must belong to the default <Site Name> Members SharePoint group for the site. Note: The specific items that appear in the Web Parts pane on your site might be different from the items that appear in this illustration. This adds the Web Part to the page and displays the Select a Workbook pane. 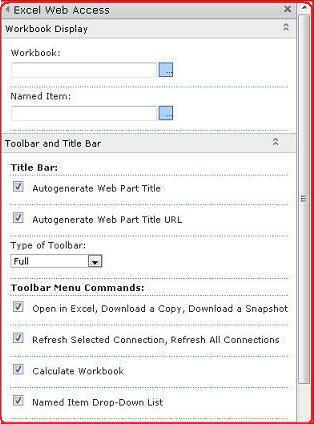 In the Excel Web Access Select a Workbook pane, click the link Click here to open the tool pane. The page changes to Edit mode, and displays the Excel Web Access tool pane. In the Workbook Display section in the Workbook text box, enter the URL or UNC of the workbook. If you do not know the URL, you can click the browse button, and then select the workbook that you want to use in the Select an Asset -- Web Page Dialog window. In the Named Item box, type the name of a named item in the workbook (such as a defined name, the name of a chart, table, PivotTable, or PivotChart) that you want displayed in the web part. In the Toolbar and Title Bar section and in the Navigation and Interactivity section, select one or more properties that you want to enable. If you want to disable a property, clear the associated check box.